NOTE: The IKF/ISCF XG Rules may not be approved in many USA States. Please confirm with IKF/ISCF or your State Athletic/Boxing Commission if this fighting style is allowed in your State if a USA Promoter. XG© is Muay Thai, MMA & San Shou Fighting with a 30 second time limit for ground fighting. Fighters will wear IKF/ISCF Approved MMA Open Finger Fight Gloves (Like used in Mixed Martial Arts) making throws easier. While Standing, Continued clinching must have CONTINUED "STRIKING" ACTION and or result in a Throw or Takedown or the referee will break the fighters up after 3 seconds of non striking action. Throws and Takedowns - All types of Judo, Wrestling and MMA Throws are Legal. Once the fighters are "BOTH" considered "Grounded", a 30 second clock will begin and they will be allowed 30 seconds (1 Minute) of ground fighting. Fighters may stand on their own prior to the 30 second time deadline ending. If so, the 30 second clock will stop. If BOTH fighters continue to stay "Grounded", at the end of 30 seconds a timer will sound, instructing the referee to stand the fighters up (No matter what position they are in) and begin the fight again. Scoring is a done by a 10 point must system. - For Info Click HERE. Unlike in San Shou, there will be no throw points awarded. There are no minimum required Kicks. There are no minimum required Throws or Takedowns. Fighters may Punch/Strike with a Closed Fist. Fighters may Strike with a Open Hand. Fighters may Strike with a Hammer Fists. Fighters may Strike with the Heel of their Palm to the Head & Body but NOT to the MASK of the Face. AMATEURS: Elbows are allowed to the body but NOT the Head Standing and or on the ground. PROS: Permitted anywhere except for the back of the head and the throat. Standing foot to foot Stomps are legal in both Pro & Amateur XG. Fighters may strike with their knees, shins and feet to all parts of the body when the fight is standing up even the head. (Except Groin of course). Some States do not allow Knees to the head in Amateur and or Pro, in which case, they will not be allowed. Low Kicks are allowed to the inside and outside of the legs. All other "High" kicks are allowed to the body & head. Knees are allowed to the body and the Head while BOTH Fighters are STANDING. Amateur matchmakers have the "OPTION" to have the amateur fighters fight WITHOUT Knees to the head. This option may be used for less experienced fighters for their beginning stages of Fighting. Knees are allowed to the body ONLY when one and or both fighters are on the ground (Grounded). A "Grounded" fighter may up-kick to a standing fighters face, as long as he is not grounded too. A fighter is determined "Grounded" or "ON THE GROUND" when that fighter's knee or a hands/arms touches the cage/ring floor. All types of Judo, Wrestling and MMA Throws are Legal. All chokes can be done with the arms and legs. NO SINGLE HAND OR FINGERTIP THROAT CHOKES! Elbow, shoulder, wrist, knee & ankle locks are allowed. Single digit locks to the fingers or toes are not legal. Heel Hooks are LEGAL for BOTH Pros and Amateurs. Amateur fighters may not "STOMP" a downed opponent but may "KICK" to the "LEGS" of a downed opponent. Pro Fighters may "KICK" to the "LEGS" of a downed opponent AND AX Kick to the Body. NO Fighter (Amateur and Pro) may "STOMP" - "KICK" or "KNEE" to the HEAD or the NECK of a downed opponent. Once one fighter's knee or hand touches the cage/ring floor, NO Leg Strikes (foot, knee or shin) are allowed to that fighter's head that is then considered "Grounded" or "on the ground". Elbows are NOT allowed to the back of the head or the throat. No Downward Or Spiking Elbows (12 O'Clock, 6 O'Clock etc. etc.) ANYWHERE. AMATEURS: Elbows (Forearms) are allowed to the body but NOT the Head. PROS: Elbows (Forearms) are allowed to the body AND the Head. No Heel Palm Strikes to the MASK of a fighters Face. NO Throws Allowed that will result in the SPIKING THE HEAD of a fighter! Smothering an opponent by cupping a hand over an opponent's mouth and nose is not allowed. A Fighter must recognize that a referee may not be able to physically see some actions and must make the referee aware if they are being bitten during a bout. Finger Strikes or Rakes to ANY part of the body. Knuckle Gouging to the face or any part of the body, including into the throat. Clawing, pinching or twisting of the flesh - Pulling, pushing on opponent's face. Throat strikes of any kind, including without limitation, grabbing the trachea, gouging of a Fighters fingers or thumb into an opponent's neck or trachea. One or two-"Handed" chokes applied directly to the throat and/or windpipe. Kicking directly to the Front, Side or Rear of Opponents Knee. No intentional strikes of any kind to the knees will be allowed including Side, Checking, Roundhouse or Hooking Kicks / (whip & or driving strikes) to the Front, Side or Rear of a fighters knee. 1st foul will be a warning. 2nd foul a point deducted or disqualification at the referees discretion and severity of the foul. If the strike stops the bout due to injury, the Referee and Event Representative will determine whether or not it was intentional or accidental. If intentional, the kicking fighter will be automatically disqualified and lose the bout. If the accidental foul occurs in the first round the bout will be declared a "No Contest." If the accidental foul occurs after a minimum of 1 round has been completed, the representative will ask each judge to score the round the accidental foul was in, and along with the scores of the other rounds, come to a decision based upon the scores of all 3 judges scorecards. A Fighter may not control an opponent's movement by holding onto the opponent's shorts or gloves. A Fighter may hold onto or grab an opponent's hand as long as the combatant is not controlling the opponent's hand by using only the material of the glove but is actually gripping the hand. It is legal for a Fighter to hold onto his own gloves or shorts. Fish hooks (to the eyes, nose, ear, or mouth) or putting a finger into any open orifice (cuts/lacerations). Groin: Groin techniques/attacks of any kind - Grabbing, Striking, etc. No Striking to the Spine - Anything behind the EARS. SIDES OF HEAD: A strike to the side or back of a receiving fighters ears is considered the back of the head. TOP: From the rear of each ear, across the top of a Fighters Head, any strike behind this is considered the back of the head. No Striking to the Back of the Neck - Anything behind the EARS. Lifting, pushing, throwing, or otherwise forcing an opponent out of the Cage/Ring. Intentionally delaying the contest due to improper equipment, or by intentionally dropping or spitting out the mouthpiece. Illegal Blow After The Round Bell or Horn. A blow that strikes a fighter after the sounding of the bell or Horn is a foul "UNLESS" the movement of the strike was already set in motion prior to the bell or Horn sounding. The referee will determine if it was "In Motion" or an accidental or intentional foul. Attacking an opponent on or during a break. Attacking an opponent who is under the care of the Referee or other Cage/Ring Official. Use abusive language in the Cage or Ring. Interference by a Fighters Cornerman/woman - Trainer. Any action or activity by a corner aimed at disrupting the contest or causing an unfair advantage to a combatant. Corners are not allowed to distract the referee or influence the actions of the referee in any manner. Flagrant disregard of the referee's instructions. Engaging in any unsportsmanlike conduct that causes an injury to an opponent. Pile-driving an opponent into the mat. A pile driver is considered to be any throw wherein a combatant controls an opponent's body by placing the opponent's feet straight up in the air and the head straight down and then forcibly driving the opponent's head into the canvas or flooring material. It should be noted that if a combatant is placed into a submission hold by his opponent and the combatant is capable of elevating his opponent, the combatant may bring his opponent down in any manner because he is not in control of his opponent's body. The combatant who is attempting the submission can either adjust his position or let go of the hold before being slammed to the canvas. It is crucial that referees are properly advised and trained on this and that the combatants fully understand this at the rules meeting. Fighters supply their own mouthpiece. Fighters supply their own handwraps. Fighters supply their own groin cups. Female Fighters supply their own Pelvic protector. Unless required by a State Athletic/Boxing Commission for MMA. This could change for multi fight - Tournament Competition. IKF Rules & Equipment page by clicking HERE. OR THE ISCF Rules & Equipment page by clicking HERE. Under no circumstances shall apparel or equipment which includes metallic and/or hard plastic and/or any edge or surface which could cause ANY injury to the fighters be allowed. Fighters must wear SHORTS ONLY - NO Pants! Board Shorts - Must be a minimum of 4 inches above knees. Boxing, Muay Thai or Kickboxing Shorts. Latex bike style shorts, "speedos". Shirts or Rash Guards are NOT allowed. Any combination of the foregoing, and/or any other clothing approved by the ISCF referee who may require such apparel to be taped or otherwise secured to ensure its stability during the match. ALL female fighters must wear ISCF approved form fitting breast support protection. Supports may not have brace, metal or hard material of any kind. 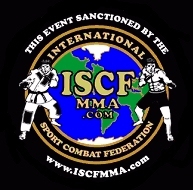 Fighters are required to wear an IKF/ISCF approved mouthpiece at all times while the bout is in progress. It is strongly recommended that all Fighters have two (2) form fitted mouthpieces available for use in their bouts. The round cannot begin if the mouthpiece is not inside the Fighters mouth and set in place. The mouthpiece must be inside the Fighters mouth and properly set at all times during the bout. Dislodged Mouthpiece: If the mouthpiece is dislodged during the bout, the referee will wait until the first opportune moment, without interfering with the action, call time out, and have the mouthpiece replaced. Fighters must tape their hands but not over their knuckles. Basic Cloth style handwraps secured by tape are OK for AMATEUR FIGHTERS. The binding of the surgeon's tape must not be applied less than one (1) inch from the knuckles of the contender's hands. A boxer may use his bandage as he likes, provided that the knuckles of his hand are not covered by the surgeon's tape. Tap may run "Between" The fingers but NOT over the Knuckles. Up to 170 lbs: The bandage shall be of no more than ten (10) yards of soft gauze, no more than two (2) inches wide, and no more than six (6) feet of surgeon's tape of one inch for each hand. The hand bandage can be increased to a maximum of twelve (12) yards and no more than two (2) inches wide, and eight (8) feet of surgeons tape of one (1) inch for each hand. 170 lbs and Up: The bandage of the hand shall be of (12) yards of soft gauze of no more than two (2) inches wide, and no more than one inch wide of (8) feet of surgeon's tape, one inch wide, for each hand. The hand bandaging can be increased to a maximum of fourteen (14) yards and no more than two (2) inches wide, and ten (10) feet of surgeons tape of one (1) inch for each hand. ALL Fighter handwarps must be "SIGNED OFF" by the Event Representative PRIOR to the beginning of their bout. AMATEURS: 6 or 8 Ounce MMA Gloves - NO LIGHTER! No Headgear is allowed - Amateur MMA Rules Apply Here. Unless a mandatory requirement by State Athletic/Boxing Commissions. AMATEURS: 3- 5 Rounds of 3 Minutes Rounds. PROS: 3-5 Rounds of 5 Minutes in length. NO Body Jewelry or Piercing Accessories may be worn during any bout. ANY "Entree" Masks, costumes or props must be approved by the IKF/ISCF prior to the start of the event. Combatant may only use soft materials to tie hair. FACIAL HAIR: If determined by the Event Representative to be a health, safety or sanitary issue, must be trimmed and or cut. VASELINE - OIL - ETC. Fighter's may lightly (as determined by the Referee) place Vaseline upon their faces at the entrance to the Cage or Ring with the Referee or Gate Keepers supervision. NO oils or Vaseline/Greases or Tar material may be used on any other part of the competitor's body. Fighters fingernails and toenails must be cut and trimmed prior to any ISCF bout. Fighters may NOT grab the ring ropes or cage AT ANY TIME the two fighters are in contact with each other during the bout in an attempt to stall action, trap his opponent, escape a technique, or otherwise gain advantage in the match. Fighters may momentarily grab the ring ropes or cage to brace or steady themselves or to gain/maintain their balance. If a fighter grabs or otherwise secures any ring rope with a hand, arm, foot or leg during the bout TO AVOID A SUBMISSION HOLD, the referee shall stop the bout and deduct two (2) points from the fighter who so grabbed the rope. If a fighter continually holds the ring ropes to rest, or pull himself from the action, avoid the bout's action, or otherwise gain advantage in the match, the referee will deduct one (1) point from the resting fighter and two (2) points for each additional time. Excessive grabbing or other use of the ring ropes in violation of these rules may result, in the referee's sole discretion, in a fighter's disqualification and an award of the bout to that fighter's opponent. The referee shall verbally instruct fighters to release the ring ropes or cage, when appropriate, prior to warning, deducting points, and/or disqualifying a fighter for violating these rules. BACK TO THE RULES PAGE CLICK HERE!